We’ve gathered the most fruitful of berries for these gourmet slices of goodness! Made with the most honest and simple of ingredients, you’ll be sure to savour every mouthful. 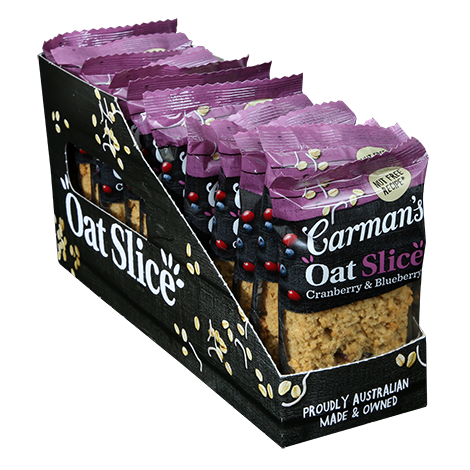 Contains: Oats, Wheat, Gluten and Milk Products. May be present: Peanuts, Tree Nuts, Sesame and Egg. Whole Grain Oats 29%, Coconut, Butter (Cream), Wheat Flour (Folate), Brown Sugar, Berries (Cranberries 6% [Cranberries, Sugar, Sunflower Oil], Blueberries 2%), Golden Syrup, Grape Juice, Grain Dextrins, Baking Soda, Natural Flavour.